High holding force, easy system connection: With its new pneumatically controlled magnetic grippers, FIPA GmbH (www.fipa.com) offers an alternative to its popular electrically controlled magnetic grippers. “FIPA is the only company to have two different solutions for magnetic grippers for handling metal sheets and other ferromagnetic workpieces,” says FIPA CEO Rainer Mehrer.. Whether electrically or pneumatically controlled – at FIPA the user is free to choose. In electronics-free environments, often found in sheet forming plants, pneumatically controlled magnetic grippers can be easily integrated. Electrically controlled magnetic grippers are particularly useful when very thin ferromagnetic sheet parts or alloyed workpieces are to be handled. This is due to the working principle. Like all magnetic grippers, the electrically controlled version picks up the workpiece solely through the force of the integrated permanent magnets. However, when the sheet is being deposited, a current pulses through the gripper coil, counteracting the magnetic force field of the permanent magnets. The residual magnetism in alloyed workpieces is thus largely compensated for, and as a result, the part is placed more quickly and securely. This allows very quick cycle times with high process reliability. The pneumatically controlled magnetic gripper family is based on a dual-action cylinder. Inside is a permanent magnet that is moved toward or away from the workpiece, generating holding force or allowing the workpiece to be deposited. NPN and PNP sensors are also available, both of which reliably monitor the piston position and signal whether a part has been gripped. To protect the surfaces of handled parts, wear-resistant, quick-change friction rings of low-marking NBR (hardness 70° Shore) are available. Both designs are highly reliable: Thanks to the permanent magnets, the workpiece remains securely attached to the gripper, even in the event of a loss of power or compressed air. 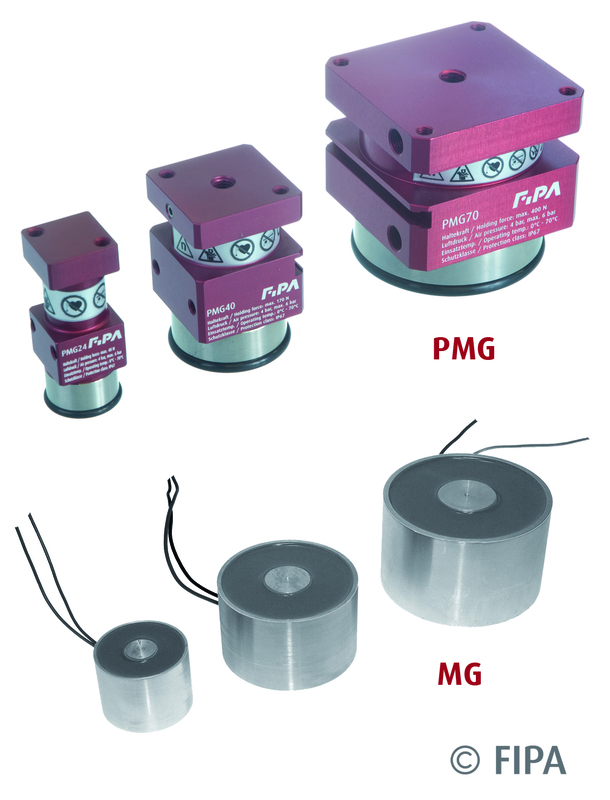 Both the pneumatically controlled and electrically controlled magnetic grippers are compatible with the FIPA gripper construction kit and can be easily integrated into gripper systems. High process reliability: High holding force. Keeps the workpiece in place, even when the compressed air supply is lost.